Not since Married with Children's Kelly Bundy has there been a hotter Bundy that Baltimore's Dylan Bundy. Picked by the Orioles with the fourth pick in the 2011 MLB Draft, it took the pitcher a little over a year to crack the team's big league roster. 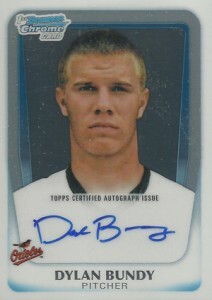 As a result, Dylan Bundy cards are set to experience a surge among collectors. Called up as a teenager, Bundy was immediately thrust into Baltimore's surprising playoff drive. Even before his promotion to the Orioles, there are well over 100 different Dylan Bundy cards to chase. None, however, are considered official rookie cards. That's not to say they're not collectible. Many of these early prospect cards, particularly those from 2011, will be among the most popular Dylan Bundy cards throughout his career. Buoyed by the brand strength of Bowman Chrome, this will be the go-to Dylan Bundy prospect card. It comes hard signed and has plenty of Refractor parallels that are also extremely popular with collectors. Now if only the pitcher looked a little happier in the generic portrait photograph. Bundy also has regular Bowman and unsigned Bowman Chrome cards in the set. 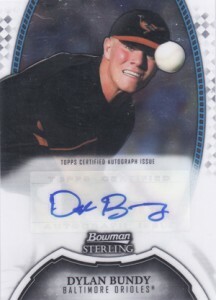 Besides the high-end feel, the biggest draw of the 2011 Bowman Sterling Dylan Bundy autograph is that it pictures him in his Orioles uniform. The photo is also much stronger than the Bowman Chrome autograph. The card uses a sticker signature, which is less desirable for many collectors. 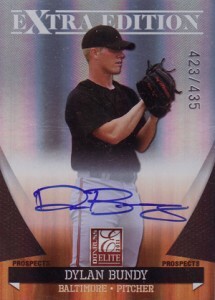 The 2011 Bowman Sterling Dylan Bundy autograph has several numbered Refractor parallels, most of which are extremely rare. Although he's not pictured in an MLB uniform, the 2011 Donruss Elite Extra Edition Dylan Bundy autograph has a couple of advantages over his Bowman Chrome and Bowman Sterling autographs from the same year. First, it's serial numbered to a very reasonable 435. While Bundy is pictured in a generic jersey, the picture is angled and proportioned well so that the lack of logos doesn't draw attention to itself. The on-card signature is also a big plus. The card also has 11 numbered parallels, most of which are also signed. Boasting an on-card signature, the Dylan Bundy 2011 Playoff Contenders Rookie Ticket Autograph is one of his better looking prospect cards. Although the design doesn't carry the traditional ticket feel from earlier Contenders football and hockey sets, it still has a generous signing area and solid photo. Although not numbered, the card has a confirmed print run of 249 copies. Part of a cross-brand set that covers all of the season's Bowman sets, the 2012 Bowman Black Dylan Bundy features a striking silver autograph on a black background. Although a redemption in 2012 Bowman Baseball, redeemed cards are already showing up. Limited to 25 copies, it will become increasingly tough to find as set collectors, prospectors and player collectors all vie for the few copies that are out there. 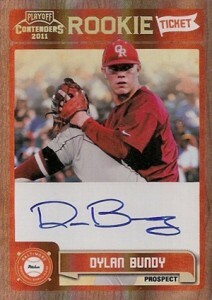 2011 Bowman Chrome Draft Prospects Dylan Bundy Auto Card BGS 9 Auto 10. 2011 Elite Extra Edition Prospects Dylan Bundy Autograph Card BGS 9 Auto 10. 2012 sets have Matt Moore’s official rookie cards in them because we can see the rookie logo on those cards. Clearly Moore’s September 14, 2011 MLB debut was too late for him to appear in the early-October release of the Topps Update product or any other end-of-year releases. So, since we are even later in September than Moore’s call up in 2011, I assume Dylan Bundy’s official rookie will appear in 2013 sets and not in any 2012 sets. (A valid assumption?) That said, does anyone know what date is a good rule-of-thumb deadline that a player needs to be called up by to appear in set(s) from that year? Or put a different way, every first-time MLBer called up on or after [ insert date ] will appear on their official rookie cards in sets release in the following year. September 1 seems to be a logical drop dead date so cards can reflect any last minute trades before rosters lock in for playoff elidgibility. But I have no evidence of that. FQ (ID 62016) � I think I remember reading a LONG time ago there was a cutoff (Aug. 31 is ringing a bell) and others would carry over to the next year. It makes sense too, as it adds some incentive to earlier sets. I don’t want to answer with certainty, but I’ll see if I can find if there’s a hard date like hockey has.